​Welcome to Fix of the Week, our weekly highlight of the best tips from our free Fix Finder instruction app. This week’s tip comes from Top 100 Teacher Joe Hallett. Steal a feel from the pro Tours to put your best stroke on autopilot. Here's how to do it. When my Tour players are draining knee-knockers with confidence, they often tell me that they feel like mannequins. What they're saying is that their setup and clubface are square, and their stroke is compact. To steal this feel, stand tall with your putter held across your chest as shown. 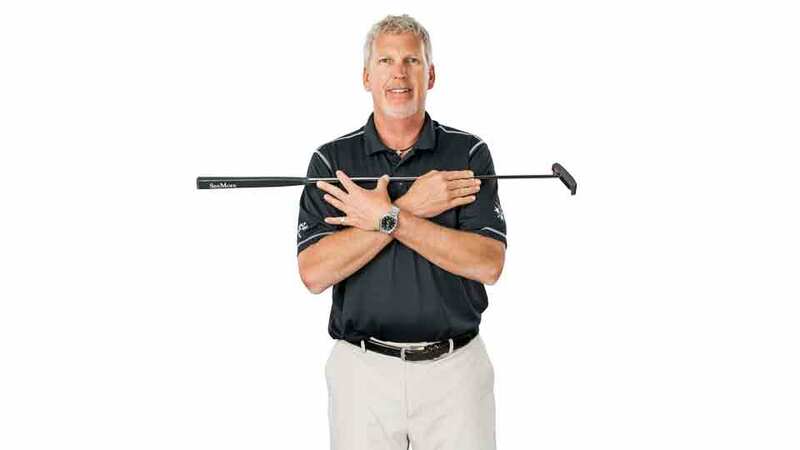 Use the shaft to check that your shoulders are level — a key first step. Always start with your stance level and in line with your intended target. 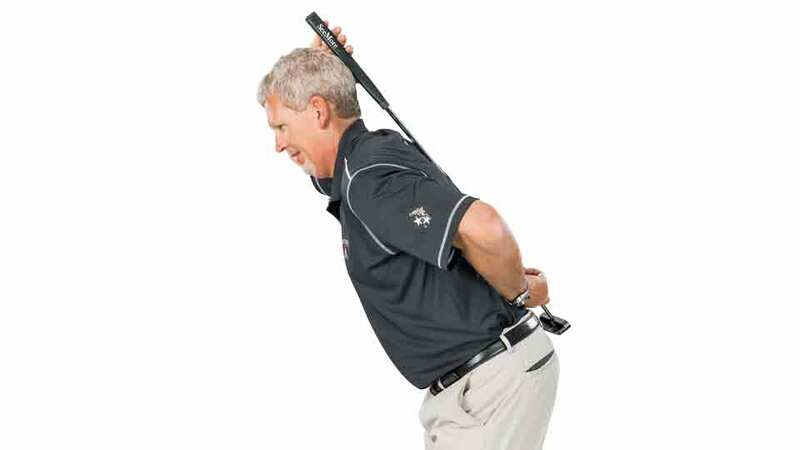 Next, place the club against your back (grip behind your head) and slowly bend forward into your posture. Tilt from your tailbone until your eyes are right over the ball, keeping your back flat against the shaft—now's not the time to fall out of alignment. You should feel your core engage here as you tilt. Allow your knees to flex, but keep your legs solid — not tense — and stable. Tilt straight over from your tailbone, engaging your core and legs. Bring the club back around and hold it straight out in front of you, making sure that the shaft and both forearms are in a straight line (tweak your right- and left-hand holds to get this right). 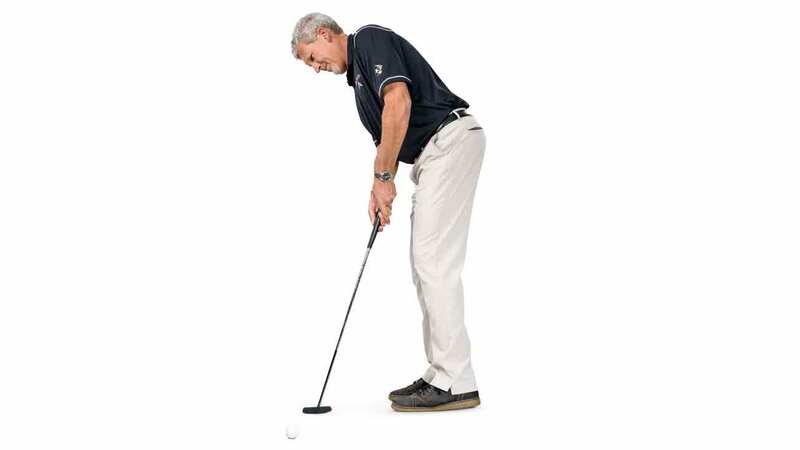 Now lower your arms and putter down to the ball and square to your intended line. Lean slightly left or toward the hole just a touch. Check that the shaft and your forearms are in a straight line with the club-face when it's square to your target. It's time for your mannequin to come to life! Well, actually, just your arms and left shoulder as you swing them back and through squarely and gently along your intended line. There's no movement at all from your legs, torso or head. Keep the length, style and speed of your stroke controlled and you'll be —ahem — posed for greatness on the greens. Think of your arms and left shoulder as the engines in your stroke.